JACKSON, Miss. — Evelyn Rasco, who has been pushing for her daughters, Jamie and Gladys Scott to be released from prison for 16 years, picked up two big supporters Tuesday — the attorney who prosecuted the case and the president of the NAACP. 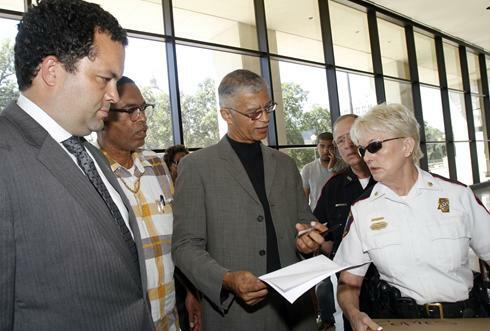 Benjamin Jealous, president of the NAACP, left, and former Jackson attorney Chokwe Lumumba, second from right, present Capitol Police Maj. Johnnie Stewart a box filled with copies of petitions and letters of supporters Jamie and Gladys Scott, sisters who have been imprisoned by the state for armed robbery. Jamie, 38, and Gladys, 36, are serving life sentences in Mississippi for their role in a 1993 robbery that netted $11, despite having no prior criminal record. The three men also arrested in connection with the robbery pleaded guilty and have served their terms. Two of them testified against the sisters in return for lesser sentences. "I have picked up so many supporters," Rasco said. "I think by people reading this, it really touches their hearts." The Scott sisters were accused of orchestrating the armed robbery of two men on a rural road near Forest, Miss., on Christmas Eve 1993. According to court documents, the sisters enticed the two men to take them on a ride to a nearby nightclub. Witnesses testified that during the ride Jamie Scott complained of nausea. When the car pulled over three men in a following car robbed them at gunpoint. After the robbery, the victims testified the sisters left with the three men. Both the victims and the accused are black. Democrat Lumumba, one of the rally organizers, said the sentence they got was "unduly severe." "In most jurisdictions, in cases like this they would not even ask to give them a life sentence," he said. Pastor C.J. Rhodes of Mount Helm Baptist Church in Jackson said there are larger concerns at work. "Here you have the trinity of race, class and gender playing itself out in our system," he said. Poor and black, Gladys and Jamie Scott did not have the resources to adequately defend themselves in court or to pursue the case through the appellate system, he said. The sisters did not testify at their trial and no one testified on their behalf. They were represented at trial by Firnist Alexander, a local attorney disbarred two years later on charges unrelated to the Scott sisters. The Mississippi State Supreme Court rebuked Alexander for "lack of diligence" and failure to communicate with clients, according to court documents. Many people drawn to their cause say that the verdict is beside the point. "Even if the assumption is the jury made the right verdict, certainly (Barbour) has to see with us that the sentence was more than it should have been," Lumumba said. So far, advocates say they have heard no response from the governor. So far, efforts to sway Barbour have had no success. Dan Turner, spokesman for Barbour, said the governor has pardoned state criminals in the past, but that he has been "very consistent in not substituting his judgment of guilt or innocence over the court." Joyner reports for The Clarion-Ledger in Jackson, Miss. Copyright 2010 USA TODAY, a division of Gannett Co. Inc. Published Thursday, September 16, 2010.